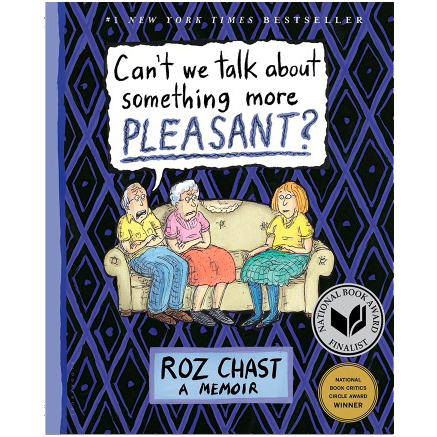 Can’t We Talk About Something Pleasant by Roz Chait In her first memoir, New Yorker cartoonist Roz Chast brings her signature wit to the topic of aging parents. Spanning the last several years of their lives and told through four-color cartoons, family photos, and documents, and a narrative as rife with laughs as it is with tears, Chast’s memoir is both comfort and comic relief for anyone experiencing the life-altering loss of elderly parents. When the Time Comes: Families with Aging Parents Share Their Struggles and Solutions by Paula Span What will you do when you get the call that a loved one has had a heart attack or a stroke? Or when you realize that a family member is too frail to live alone but too healthy for a nursing home? Journalist Paula Span shares the resonant narratives of several families who faced these questions. Each family contemplates the alternatives in elder care (from assisted living to multigenerational living to home care, nursing care, and at the end, hospice care) and chooses the right path for its needs. Span writes about the families’ emotional challenges, their practical discoveries, and the good news that some of them find a situation that has worked for them and their loved ones. And many find joy in the duty of caring for an older loved one.